Good morning! I hope your weekend was great. Unfortunately, my mom slipped and fell and broke her right shoulder and her left wrist. Needless to say she is having a hard time doing anything. She is at home resting comfortably and I am putting together a Valentine's Day care package. If you are looking for a sweet treat for your Valentine(s) I have a delicious, sweet, salty, chocolate treat that they will love. 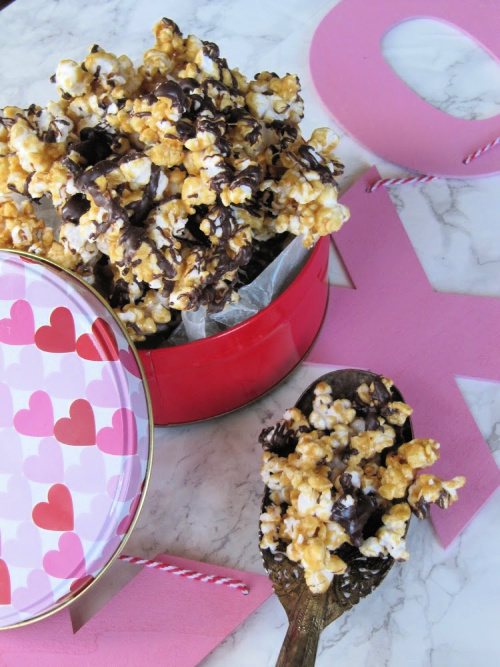 It is basically my homemade Caramel Corn drizzled with your favorite chocolate(s). 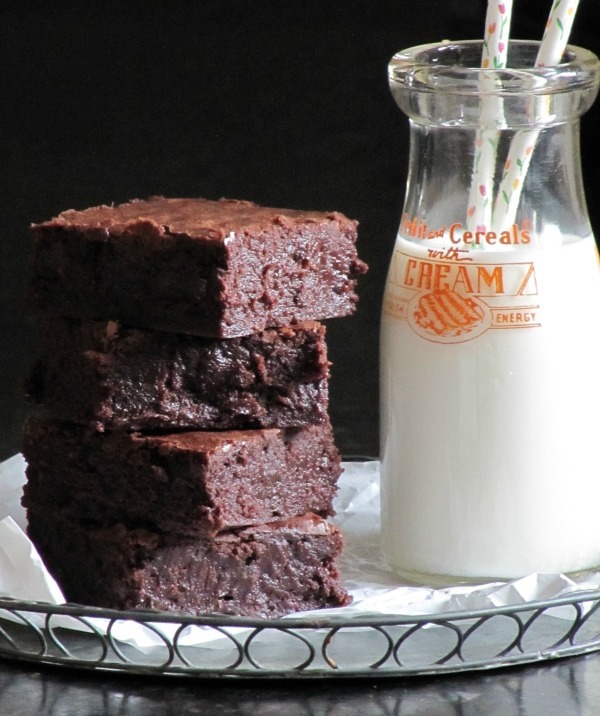 I used Guittard 64% chocolate but you could use your favorite chocolate bars or chips; dark, milk or white or even a mixture of the three to drizzle over the top. If you do not want to make your own Caramel Corn than you could buy a bag or purchase a bag of Kettle Corn( my favorite is from Trader Joe's) and simply drizzle melted chocolate over the top. Let is set, then break it apart and bag it up in a cellophane bag tied with grosgrain ribbon or put it in a decorative tin. I also made some sugar cookies and some Baked Bakery brownies to send along with my chocolate caramel corn in my Valentine's Day gift boxes. 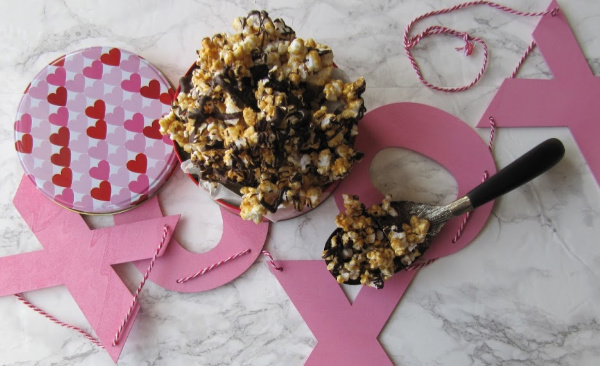 Do you have a favorite homemade gift to give to your Valentine? Or do you go out and find them a huge box of their favorite chocolates? If it's still wintery cold where your mother lives, consider getting her a cape. So much easier to get in and out of. I had one and loaned it to my mom, who loved it. It was pretty heavy, like a wool blanket. Nice and cozy. Hopefully your mother's recovery time goes smoothly. Sorry to hear about your Mom...but she will be loving all the extra treats! My grandma made the best caramel corn. So sweet of you to treat your mom. Hope she's not in terrible pain.